Spanish tourism continues to break records this year as INE reports that the Iberian nation welcomed over 10.5 million tourists in July 2017 – 10% more than last year’s figures. British visitors were the largest group, accounting for over 2.3 million arrivals during the month. And as Brits return from their summer holidays to the unpredictable British weather, buying a holiday home in Spain becomes ever more tempting. The Mediterranean lifestyle, great year-round climate and cheap flights – it’s no wonder that over the last decade, Spain has been the most popular location for Brits looking to own property overseas. Visitors have once again been hooked by the charms of Torrevieja, topping the list as the most popular destination for a second home this summer. This town in the southern part of the Costa Blanca, located in the Alicante province, is one of the area’s most favoured destinations with white sandy beaches, affordable holiday homes and Alicante International Airport an easy 45-minute drive away. For those looking for the ultimate holiday home in Spain then it must be Marbella, the property hotspot on the Costa del Sol. A firm favourite with A (to Z-list!) celebrities, sportsmen and women, entrepreneurs, couples and families alike, Marbella, just 40 minutes’ drive from Malaga airport, takes the number 2 spot. With superb flight connections year round and even more coming (Air Baltic has announced new routes for summer 2018) not to mention luxury penthouses such as La Floresta Sur, from Taylor Wimpey Espana available from €202,000 + VAT, it’s not hard to see why buyers flock here year after year. Many holidaymakers fall in love with this holiday hotspot as they are never far from the sea or a golf course. Situated on the Costa del Sol as it has the perfect setting for capturing the international growing demand for second homes with amenities on hand. The new Horizon Golf complex typifies the high-end properties buyers can purchase in Mijas. In partnership with FBD Hotels and Resorts, Taylor Wimpey Espana has unveiled a new phase of this development comprised of 2 and 3 bedroom terraced homes, which boast breathtaking views over the famous Campo Asia golf course. Price start from £380,000 + VAT (410.000€). Mallorca is a destination that has grown and grown in popularity over the years as it offers the perfect sunny escape for international holiday makers and home owners alike. The preferred holiday destination of the Spanish Royal Family and the location of numerous A-listers’ second homes, Mallorca is known for its exclusive feel. 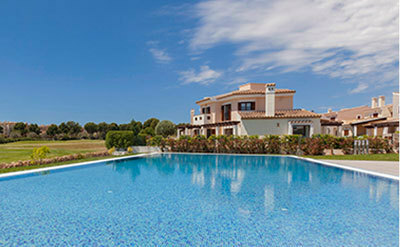 Mallorca is also home to the Taylor Wimpey Espana head office and whilst the developer boasts numerous premium sites across the island, it is properties in Calvia, in the south west corner, that have been the most requested this summer.